Cycling has enjoyed a resurgence of popularity in recent years as a result of an increased concern for both the environment and living a healthier lifestyle. Unfortunately, more bicycles on the road in Texas also increase the chance of being involved in a bicycle traffic accident. Across the United States, 677 pedal cyclists (someone on a vehicle powered solely by pedals) were killed in 2011, and another 48,000 were injured in crashes with motor vehicles, representing 2 percent of deaths and 2 percent of injuries caused by traffic collisions that year according to the National Highway Traffic Safety Administration (NHTSA). In that same year, 43 bicyclists were fatally injured in traffic collisions in Texas, making up 1.4 percent of all traffic fatalities. Raw numbers point to an increase in bicycle deaths and injuries. The number of fatalities in 2011 reflects a 10 percent increase from the previous year. Although the number of deaths for young cyclists has been decreasing since 1975, the number of deaths for cyclists over age 20 has increased 167 percent since 1975, according to the Insurance Institute for Highway Safety. Texans are concerned about the dangers of cycling, according to a 2008 survey conducted by the Center for Transportation Research at The University of Texas at Austin. In that survey, 1,605 bicyclists over age 18 from over 100 Texas cities were asked a variety of questions about their bicycling habits and concerns. Almost half of the respondents used a bicycle to commute on a regular basis. Almost 70 percent of the respondents felt that bicycling is “very dangerous” or “somewhat dangerous” with regard to the possibility of being involved in a traffic accident. Age – The average age of a bicycle traffic accident victim has been steadily increasing for decades. Currently, the average age for all injuries and deaths attributable to bicycle accidents is 32. Cyclists in the 45-54 age group have the highest fatality rate. In addition, the average age of fatal accident victims is 43. The highest injury rate is in the 16-20 age group. Children under 16 account for 10 percent of all fatal bicycle traffic crash victims and 19 percent of all injury victims. Gender – Gender appears to be a significant risk factor as well. Whether this is because more males ride bicycles or because they engage in riskier behavior when riding is not clear. In 2011, males accounted for 85 percent of all bicycle traffic deaths and 78 percent of all injuries. Per capita, men had a bicycle accident fatality rate six times higher than women, and four times higher for injuries. Location – Fatal bicycle accidents are much more likely to occur in an urban setting, with 69 percent of all deaths occurring in a city. One in three fatal accidents in 2011 took place at an intersection. Time – Almost a third of bicycle traffic collisions occur between the hours of 4 p.m. and 8 p.m. Roughly another 40 percent of collisions took place in the two separate four-hour intervals before and after that time. Alcohol– Alcohol use on the part of either the cyclist or the driver of the motor vehicle was reported in 37 percent of all fatal accidents in 2011. Texas laws give bicycle riders all of the same rights and responsibilities as people who drive motor vehicles. Sadly, some motorists fail to share the road and give bicyclists the respect and attention they deserve. Failure to yield right of way (for example, running a red light or stop sign). Backing up or pulling out without looking. Sideswiping cyclists on the shoulder or in the turning lane. Bicycle riders are very much at risk for catastrophic injuries. Other than a helmet, cyclists have little to protect them from the impact with other vehicles, fixed objects and the pavement itself. Head injuries are the most common cause of death for bicyclists. Helmets have been shown to reduce the risk of traumatic brain injury by as much as 88 percent, according to NHTSA. However, helmets do not provide complete protection, particularly when high speeds are involved. Knee, ankle, wrist, elbow and shoulder injuries. 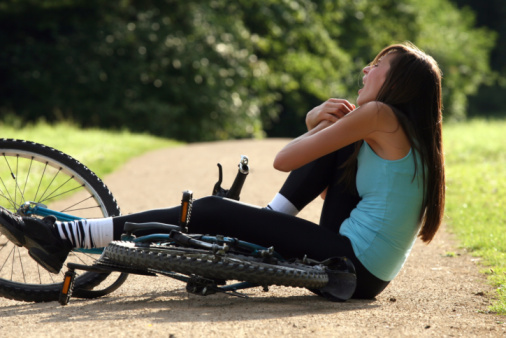 If you or a loved one has suffered serious injuries in a bicycle accident in Houston or elsewhere in Southeast Texas, contact the Law Office of Kevin Krist today for a free consultation about your case. Simply call 281-677-3962, or use the firm’s online form. Let Kevin Krist explain how he can put his personal, proven experience to work for you, so you can get the compensation you deserve as a Texas accident victim. Kevin Krist represents personal injury victims on a contingency fee basis, which means you pay no fees unless he recovers compensation on your claim.